Indulge in a light and satisfyingly Crunchy Autumn Chicken Salad. 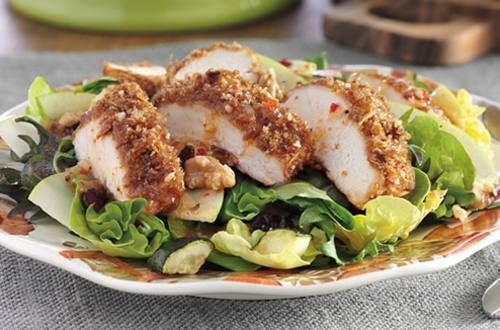 A medley of mixed salad greens, walnuts, cranberries and other veggies add a whole lot of flavor to this delicious chicken recipe. 2 Combine Knorr® French Onion recipe mix with bread crumbs in shallow bowl and set aside. 3 Coat chicken with Mayonnaise, then with bread crumb mixture. Arrange chicken on baking sheet, then arrange zucchini around chicken. Bake, turning zucchini once, until chicken is thoroughly cooked, about 20 minutes. Cool chicken slightly, then slice. 4 Arrange salad greens on serving platter. Top with chicken and zucchini, then remaining ingredients. Drizzle with your favorite dressing. Lightly roasted walnuts add crunch, flavor and valuable nutritients to this meal-worthy salad.